Have you ever been killing it on the dance floor of a next level wedding, only for the lights to turn on at 11 pm and the DJ to tell you that it’s time to head out…because of a noise complaint? It’s every bride’s nightmare, but not uncommon, particularly in rural areas with pesky noise bylaws. 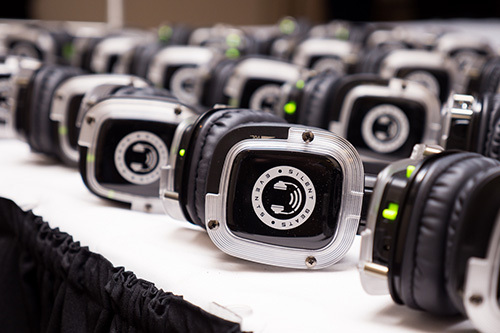 Silent disco parties effectively erase this all-too-common problem by delivering music right into the ears of guests. Though dancers might be going all-out on the dance floor, the most neighbours might hear are footfalls and conversation. Satisfying every musical taste at a wedding is impossible, but with Silent Beats you can get pretty close. The headphones all have three tunable channels. The means you can offer your guests three distinct dance parties. Everyone from teenagers to great-grandmothers can be appealed to. And, let’s be honest, the weddings that strike a chord with people are the ones that speak directly to them. Same-day video edits. Cupcake wedding cakes. Transparent boustier dresses. Food trucks. Image mapping. Do you remember the first time you went to a wedding that featured one of these trends? Of course you do, and that’s because the weddings that are most memorable are the ones that are at the forefront of a new trend. Silent weddings are the next big thing in wedding entertainment trends and from what we’ve heard so far we’re confident that guests now will be impressed – and won’t soon forget the experience. Sold on silent weddings? Check out Silent Beats Events for more details.